One Steph Beyond: Tango in the night! I woke this morning feeling rough and miserable! My small dark room on the 4th floor of the (not so grand) Gran Hotel Argentino could have been anywhere! I really didn't know where I was or what I was doing there! Slowly I came too, pulled myself out of bed and opened the curtains for the first time. Staring back at me was an identical wall to the one I guessed I was looking out of! An inkling of light came in but no more. I felt rough and I suddenly felt lonely! Why was I doing this? Why WAS I here! It would take a couple of hours before the answer came back to me. Until then I was grumpy! Tiredness can really mess with your head! My flight from New Zealand had taken 11 hours to Santiago with a 5 hour wait before another 2 hour flight to Buenos Aires. I was lucky enough to be the only person on the plane with loads of room! I had 4 seats to myself and everyone else was packed in as usual. I had more space than those over fed gits in first class and I made the most of it! I managed to sleep for six hours. Throw in a couple of meals and a couple of films and the flight was over before I knew it! The hardest part was the 5 hour wait in the airport. I'd got up at 8am on Friday in Auckland and went to bed in Buenos Aires 38 hours later on the same day! I guessed this was why I felt dazed and confused. In my gumpiness I wasn't digging BA. I wanted nothing to do with it! It could keep it's Latin culture and flair. It could keep its world famous cuisine and it could stick it's Obelisk right up it's Ruta 3 for all I cared! I didn't have the money to enjoy a city like this anyway!!!! Having walked some distance at pace to clear my head, I stopped outside a coffee shop, grabbed a table and ordered a cappuccino. While I waited I bought a pair of shades from the street vendor guy, put them on and for half an hour or so I sat and watched the world go by. That is when the grumpy cloud finally disbursed and the sun came up again over my little world! Interesting tombs! Not sure who's! I spent the rest of the day wondering around. I even bought some new, more flowing clothes to replace my hot black pants and t shirt. After shopping I had more coffee and some delicious Parma ham. 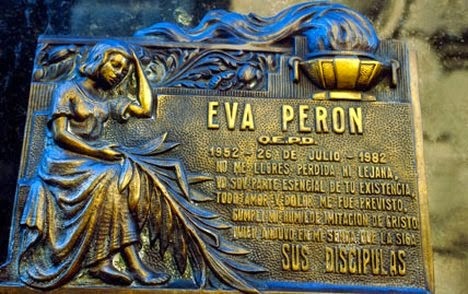 From there I headed over to the famous La Recoleta Cemetery which contains the graves of notable Argentineans such as Eva Peron, Presidents of Argentina and Nobel Prize winners. You could find Eva's grave easily by the number of people stood around it. Popular in death as she was in life. By the time I got back to my dingy hotel room I was digging Buenos Aires and more importantly I felt I had the energy to start looking at the next leg of my trip. I checked my bank account and found a payment from Ride Magazine for my article. Should I spend it wisely? NO! I refuse to be sensible! I have decided to indulge in the culture and cuisine of Buenos Aires and enjoy city life for one night only! I earned it! Tomorrow evening I will be collected from my hotel and taken to a Tango and dinner show where I will indulge in some fine Argentinian cuisine whilst watching the performance! It's not exactly the VIP box but I'm not sure they'd allow trainers anyway! The experience will be that much sweeter knowing it's paid for by my first PAID article! I have decided to couch surf my way down to Ushuaia and my route is now pretty much set. Blog post to follow with route! And the next part of this epic adventure starts. Hope NZ was good to you any pics or video blog? Hope the Top Gear boys haven't made things a bit tricky for you Steph. The end of the world is nye! Riding in to a new year!